RAM trucks have proven themselves time and time again both on road and off. With the additional option of air-suspension, RAM offered a new level of capability with variable ride height, improved ride quality and better payload management. BDS Suspension now offers a 4″ suspension lift engineered to maximize the potential of the air ride equipped 2014-2015 RAM 1500 4WD. Designed to retain full use of the air suspension and its adjustability, this new lift system integrates seamlessly while allowing fitment of 35″ tires. As with all BDS lift kits this new 4″ system is backed by Factory Protection Plus offering a No Fine Print Lifetime Warranty, FMVSS No.126 ESC system compliance, and a 5-year 100,000-mile drivetrain warranty at no additional cost. Improve the stance and capability of your air ride equipped RAM 1500 with BDS Suspension. 4″ Air Ride Lift Kits: These new 4″ lift kits for the 2014-2015 RAM 1500 trucks with air ride are engineered to the highest standard to maximize the truck’s potential. These kits have undergone more than a year of development and testing to ensure they are up to the use and abuse truck owners expect from BDS. Up front this 4″ system include a pair of high clearance lasercut crossmembers, 3-point differential relocation system and differential skid plate creating a stout subframe for the suspension components to be installed. New ductile iron CNC machined steering knuckles are supplied along with heavy duty tie rod ends to keep the steering compatible with OE operating standards. Top mounted strut spacers are supplied to allow the use of the air-ride front air bag struts along with all the necessary air line fittings. A billet aluminum driveshaft spacers is supplied to lengthen the factory front driveline along with extended stainless steel braided brake lines, sway bar link extensions and all the necessary hardware to complete the install. The rear of the air-ride equipped RAM 1500 mimics the standard RAM 1500 with the exception of adjustable height rear air bags. 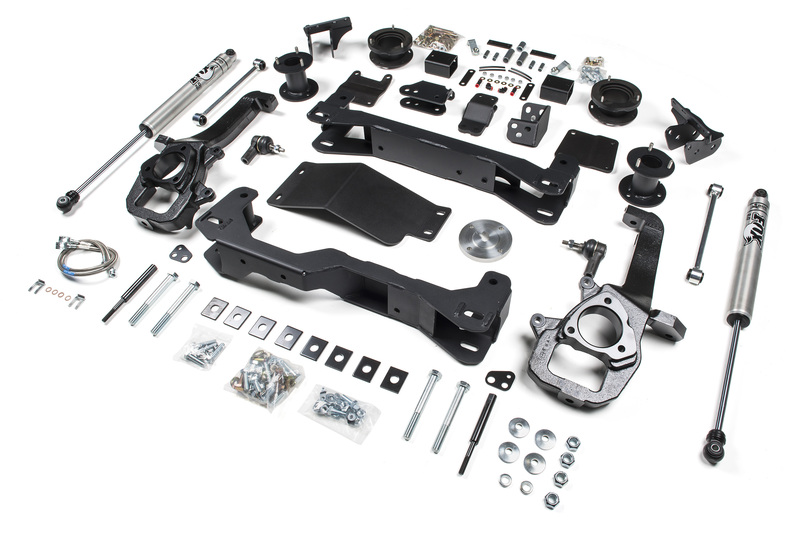 BDS supplies rear upper control arm relocation brackets to correct the geometry, a track bar correction bracket to recenter the axle and new extended sway bar links to improve stability on and off-road, brake line correction, and bump stop extensions. The new height comes from a pair of top mounted air bag spacers are used to maintain proper positioning and functionality of the factory air bags. 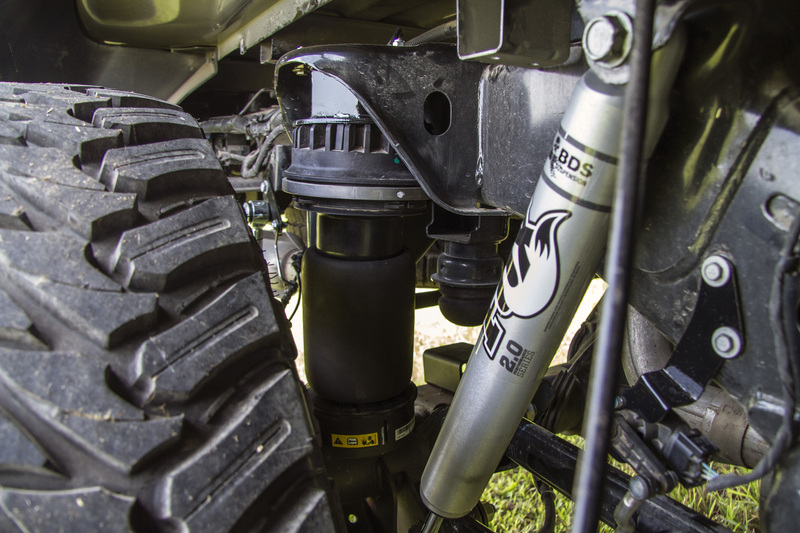 Finishing offer the 4″ air-ride kits are a pair shocks, BDS offers both the 5500-series hydraulic or Fox 2.0 series gas shocks specifically tuned to maximize your trucks performance in any terrain. This new 4″ lift kit corrects the suspension geometry and allow for full use of the ride height adjustability while allowing clearance for 35″ tires. Get more out of your air suspension equipped RAM 1500 with BDS! When are the 6 in lift kits gonna be available! For the 2015 air rider dodge trucks?? @Travis, the crossmembers and steering knuckles used on our RAM 1500 kits (air and non-air) are designed to function properly between 4’’ and 6’’ of lift. The kit is designed as a base 4’’ to keep the suspension functioning within its designed parameters even while aired up to around 6’’ of lift. If taller air bag spacers were used the suspension would be able to be aired up too tall causing premature wear of certain components like upper ball joints, CV axles, etc. We found that 4’’ was the ideal height to function properly, ride well on road, and offer full adjustability of the air ride system. No plans for a base 6” kit for the air ride RAM 1500 trucks. Thank you for sticking with it and getting this released. I’m sure this will make a lot of people very happy!! Will this work with the 2013 model year too? @Sean, at this point we’ve only tested the kit on the 2014-2015 RAM 1500s with air-ride. While we assume they will fit the 2013 model as well (similar to how the standard strut/coil RAM 1500s are the same from 2013-2015) we cannot confirm fitment at this time. Has this kit been tested on the 2013 model yet? I’m interested but not willing to take that gamble. Will this system work on the 2500’s as well, or do you have a different system for them? Thanks for the response Carter. I’ve got a nice 2014 2500 limited gasser I could lend you for R&D if you put a sweet 4″ bds package on it for me lol! We have heard from customers that there is some compatibility between our current 4” kits and the airride Ram 2500 suspension. Unfortunately it not something we have confirmed at this point. I’ve been waiting for this product since 2014 when I got my 1500 Longhorn, but I have a question, is there any rubbing or something in the lowest height using 35×12.5 and the specified 20×9 (5 bs) wheels? Because I think when I’m in the highway the height goes down by itself to reduce fuel consumption, also to leave the car it goes down by itself. Will BDS offer a conversion kit to remove the air-ride suspension allowing ram owners ability to install the non-air-ride BDS 6″ suspesion lift? Its been a year, do you know if the 6′” coilover can be replace the air ride system with minimal electronic mitigation or not? theres a 3 inch body lift available for Ram Trucks with or without the air ride will the 4 inch lift you offer work with it. While we haven’t tested out 4” kit in combination with a 3” body lift, there shouldn’t be any major issues. Who makes the body lift? If you look in the comment above I listed the link for the Zone Offroad 1.5″ body lift, http://zoneoffroad.com/zone-offroad-products-1.5in-body-lift-dodge-ram-1500/D9150. For taller body lifts you’ll need to look around on the internet to see who offers them. Just curious as to how the truck rides with this lift? It seems to just space out the stock air struts. Does it maintain ride quality comparable to the stock setup? 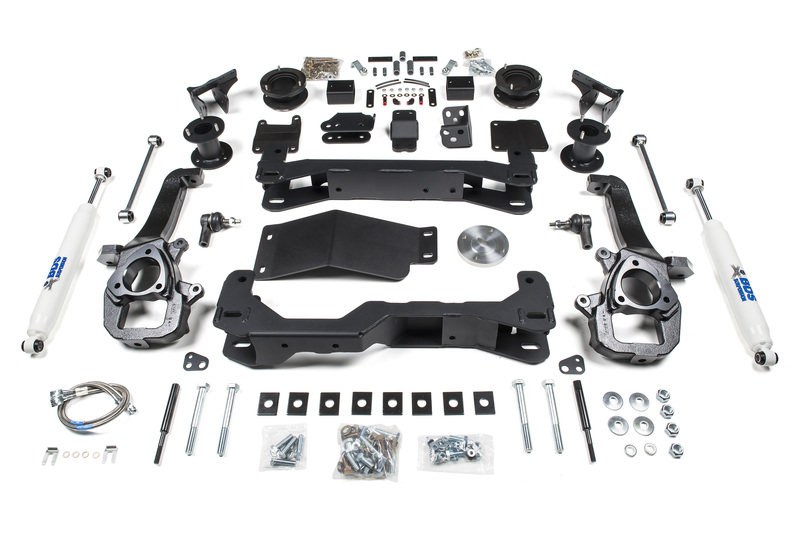 this kit is designed to maintain ride quality, handling, and overall drivability. The kit corrects the suspension and steering geometry using the crossmembers, steering knuckles, differential relocation, sway bar links, and tie rods ends and offers extra ride height by way of spacers that allow full use and benefits of the air strut/air bags. Is there any chance of getting a quick video of the air suspension going through the 4 stages with this lift kit? I am sure others would appreciate it. Any update if the 4” lift kit work on the 2013 ram 1500 ? Jobin, We offer kits for the standard strut/coil equipped 2013-2015 RAM 1500 4WD trucks. At this point we have not testing the air-ride equipped 2013 RAM 1500 to confirm fitment of our 2014-2015 RAM 1500 air ride lift kits. Part of the issue is sourcing a truck to test fit parts at our Coldwater, MI based facility. The air ride was sold in very low quantities when compared to the standard RAM 1500 and even fewer when it was first released in 2013.
hi ,we instaled a 4″ kit with air ride and the back pocket keep blowing.. maybe you would know the probleme? Hey Andrew, the kit is designed to use a small rear airbag spacer to relocate the mount and retain functionality. If you’re having issues with the bags please contact BDS tech support to discuss it at (517) 279-2135 or tech@bds-suspension.com and then contact your RAM dealer. Any progress on a kit for 2015 2500 cummins with factory air suspension? Thank you! Sorry Chris, company policy dictates we can’t discuss what kits may or may not be in development, progress updates, kit details or pricing until products are on the shelf and we release them for sale. Referring to your post on June 15th., am I to assume that the air ride components could simply be removed from a 2500 allowing your standard kits to be installed? While we have had customers say they’ve swapped from airride to standard strut/coil suspension on the RAM 1500s, we have not completed it ourself as our focus has been on designing kits to keep the OEM equipped airride systems in place. While the standard system will physically fit, the newer airride equipped trucks have an advanced and oftentimes temperamental electronics that monitor and control the vehicles airbags, adjust ride height, adapt to road conditions, lower the vehicle at highway speed, etc. We’d expect there will be complications with removing the system and having the truck function properly. Is there a way you could send me a few pics of what a truck looks like with this kit on? Thanks. there are links in the left column of the new product announcement above to view high-res shots of the kit, the truck and close up detail shots of the suspension installed on the RAM 1500 w/ air ride. Do you have or are you going to have a 2 inch lift for the Ram 1500 w/air ride? @Dave, its a possibility in the future, however it wouldn’t be as simple as installing a top mounted air bag spacer. At minimum it would require upper control arms, diff drop plus the airbag spacers to correct the geometry and not max out the suspension angles when aired up (suspension would have adjustability from 0-4” of lift). If I have the 4″air lift and. 3 inch body what size tires would I be able to fit ? while we have spec’d that lift combination, I’d assume you could fit a 37×12.50 on a moderately sized wheels. Keep in mind the 4” suspension on the AirRide Rams will vary between 2” and 6” of lift depending on the mode and driving conditions. Have y’all tried this kit for a 13 Ram 1500 yet? Being waiting for this lift kit!!! Great job guys! Can’t wait to get my order and install. I’m looking for a leveling kit for a 2015 ram with air suspension. Hi I have the 2015 RAM 1500 eco-diesel with the factory air-suspension (I believe you call it air-ride) its the Longhorn Laramie with a short box 5’7″. If I understand correctly I have a payload of 1360 lbs, I am pretty sure its well under rated. What I want to do is add a camper that is made for the short box, but its wet-weight is 2300 lbs’. So without having to buy another truck is there something I can do to increase my payload or decrease the affects of the new load such as, over sized brakes, beefier tires, or the suspension kit you have out for the 2015’s with air ride. I should have though of this before I bought the truck, and the wife will kill me if I have to spend more money on a bigger truck. Please help…. Hey Shane, I’m not sure if there are any companies (Air Lift, Firestone, etc) offering a heavy duty replacement bag for the stock RAM 1500s. Our suspension lift is designed to retain the stock air bags and uses top mounted steel spacers which won’t add or take away from the load capacity. You’ll also want to look into a heavier load rated tire (likely E) for the additional weight. Thanks Carter (hope that’s your first name) can I ask what you mean “our suspension lift is designed to retain the stock air bags and uses top mounted steel spacers which won’t add or take away from the load capacity” I am not much of a mechanic. I was thinking keep the same air-bag, add your suspension kit (to prevent the truck from bottoming out due to increased load or a sudden excessive load say from hitting a pot-hole), heavier braking system say brakes from the 2500 or 3500 if they fit, plus heavier load rated tires. on this application the suspension lift is used to reposition all the factory suspension components to work within the parameters of the factory air suspension at a ride height 4” taller (i.e. lower control arms are relocated, longer steering knuckles are supplied, front differential is relocated, longer sway bar links and bump stop extensions are included, etc). The factory air bags are retained with our kit. To allow them to function at the new taller ride height we supply steel spacer brackets that mount on top of the air bags to connect to the stock mounting location. Doing this retains the ride quality and allows the suspension to function as it does from the factory with ride height adjustment from between roughly 2 to 6” of lift (stock the trucks ride height is adjustable between -2 to 2” of lift). Hey Eric, while many customers have successfully installed the #1623H kit on new RAM Rebels, there are a few differences with these trucks (mostly electronic) that typically require a trip to the RAM dealer to reflash the truck once the lift is installed. We’ve been working on a specific set of instructions for the RAM Rebel trucks, so until those steps have been finalized we won’t have the Rebels listed as compatible. For more on the topic you can contact the BDS tech support team at (517) 279-2135. 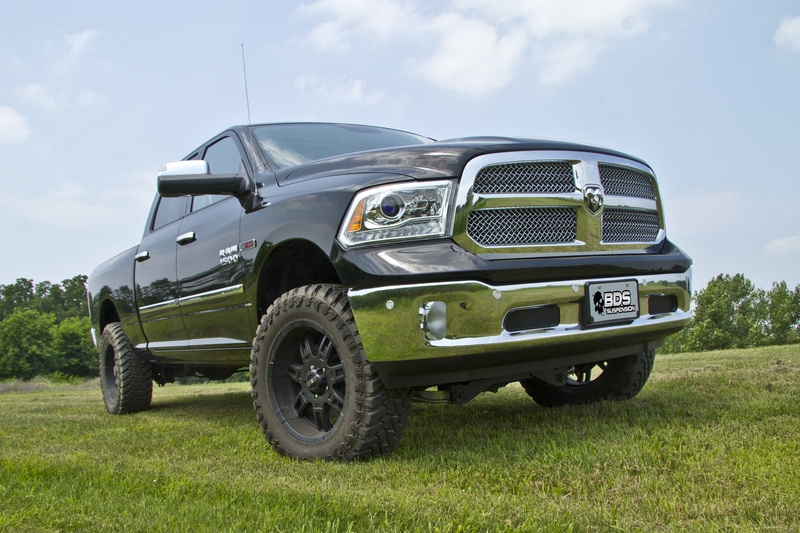 Eric- Do you know if a 2″ leveling kit is available (or coming soon) for a 2014 Ram 4×4 with air ride? Thanks. Will this 4″ system work on a 2011 ram 1500 4×4 and is the air suspension adjustable up to 6″ of lift? I was curious if the installing this 4″ kit & 35″ tires will affect my factory warranty?? Hey Dave, by law a lift kit doesn’t void the vehicle’s warranty. The Magnuson Moss Warranty Act covers the consumer stating the dealer cannot deny warranty due to an accessory/modification without proving (in a court of law) how the accessory/modification is directly related to the failure of an OEM part. While each dealership has different rules it should be said that there are dealerships around the world running our lift kits on brand new dealership vehicles. In the case of the air ride RAM 1500 kids our kit is designed to retain full use and adjustability of the factory air suspension. Has there been any progress on the Ram Rebel instructions? Hey Ben, I know its on the list of projects that our engineers are working on along with several test fit and new product development projects. Once they have the Ram Rebel kits ready to go they will notify the rest of the company and we’ll send out an announcement about it to notify the public and media. I have a 2014 Ram 1500 Sport with the Air Ride Suspension. I also think a 2″ Lift would be a good option for the truck. It would give you 0″ – 4″ lift range when coupled with the Factory Air Suspension. Your normal ride height would be 2″ up over stock with the ability to go to 4″ when in “Off-Road” 2 mode. “Aero” Mode would be 1″ up which could still help with fuel economy. I have a 2016 Ram Rebel with the 4 corner Air. what are the options for installing a fixed lift height. what is needed to over ride the auto leveling (ie. additional weight in box or trailer tongue weight)?? Hey Dale, while we have had customers install the 4” air ride lift kits on the RAM Rebels, there are some differences that require additional modifications and a trip to the dealer, currently we don’t have the Rebels listed as compatible, feel free to contact our tech department for more on the topic at (517) 279-2135. Our 4” air ride lift kit is designed to retain full functionality of the air suspension and doesn’t change/over ride the factory electronics including auto-leveling features. Any recommended installers in Ontario Canada around the Toronto area? Hey, Carter, a question for you. You wrote in one of the replies above that the 4″ air ride lift kit retains the ride quality and allows the suspension to function as it does from the factory with ride height adjustment from between roughly 2 to 6” of lift. But am I right that a 2″ you would have to be in entry/exit mode, and that you can only stay in the mode at relatively low speeds? In other words, with your kit installed, is there any way to keep the truck at 2″ at driving speed? I would likely never want to be higher than that except in off-road driving. Jimmy did you get your problem with the air-suspension resolved? anything in the works for duallies with factory bags? Had this kit installed on my truck and now front struts won’t take air. It has been in the shop for 6 weeks now and RAM has refused to work on it until it is returned to stock. They say my warranty is not voided they just won’t touch it because it’s aftermarket and wasn’t done by a dealership. What do I do? Do you have any advice on how to remedy this? I’m having this lift installed in about 3weeks, would you please post the resolution to the strut issue? 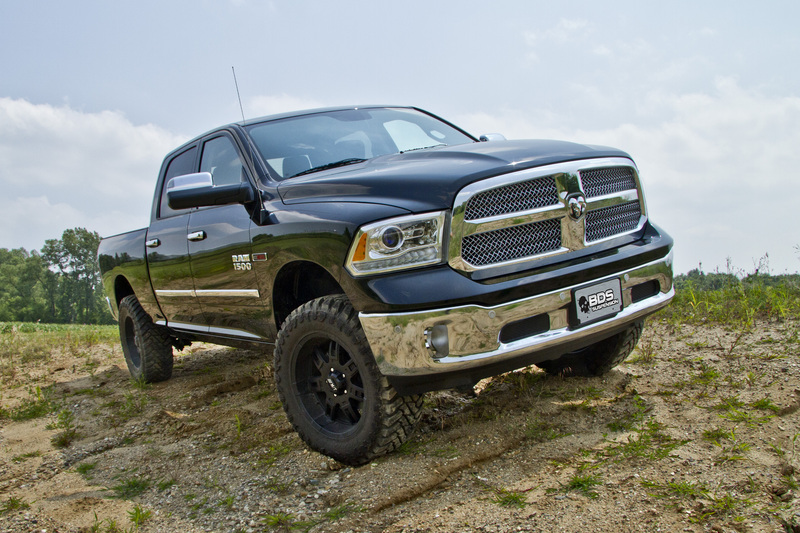 Will this 4″ lift work on the 2015 1500 RAM Rebel? while we have had customers install the 4” air ride RAM lift kits on RAM Rebels, there are some differences that may require additional modifications and a trip to the dealer. Currently we don’t have the Rebels listed as compatible, but we are working on a list of additional steps to allow Rebel owners to install this kit. Feel free to contact our tech department for more on the topic at (517) 279-2135. Will this 4″ lift works on a 2016 1500 RAM limited ? Can I keep the stock 20 wheels ? Can I run some 35s also ? Hey Jaime, we’ve had the opportunity to bring several air-ride equipped RAM 1500s as well as Rebels into our R&D shop and have found inconsistancies between the trucks in relation to air bags and the software used to control them. While they have successful lifted all 1/2-ton RAM air ride models there hasn’t been consistency in the process as some requiring recalibration at the dealer before lifting, others after the lift was installed, while some required minor modifications to the sensor brackets to function properly. At this time we don’t have a one-size-fits-all solution to lifting the Rebels, but our tech support team is well versed in the solutions if issues arise. At this time our engineering team hasn’t officially released the air ride kits to be compatible with the Rebel. 1)	The Rear lift is 2.5 inches – is it possible to ONLY lift the front 2.5 inches or max 3.0 inches with different spacers as I want to keep the truck rake the same as stock using your kit? 2)	I am waiting for AMP Research to release their PowerSteps for my truck as they advised, the 2016 RAMs are marginally different where the 2016s have a SRS fixed bracket that requires AMP to remold their PowerSteps for the 2016 RAMs – will this be a factor with the BDS Air-Ride suspension lift kit? hello i have a 2016 dodge ram 1500 with the factory air ride and i was wondering if you all are going to make a leveling kit for them. i have searched alot and cant seem to find one. Hey Jamie, we’ve addressed this in other comments, the Air Ride equipped RAM 1500 has roughly 4” of ride height adjustment through the various modes, 2” up and 2” down. Adding a 2” leveling kit to the factory suspension would force it to operate between 0” and 4” of lift which the factory geometry wasn’t designed to do. Along with alignment issues, the ball joints, CV shafts and steering would be pushed to their limits likely causing premature wear/failure. Our engineers have designed the 4” air ride systems to function ideally between 4-6” of lift as well as function at the lowest ride height setting. The kit retains full functionally of the adjustable ride height while sitting 4” taller above factory ride height allowing for 35” tires to be installed. When the 4in air supsension is installed can the truck be drivin at the max hight for daily driving? And can it be installed on a 2013 ram laramie 2 wheel drive? Hey Tony, our 4” kit allows full functionality of the adjustable ride height, just 4” taller than stock. So with the suspension aired up to the max you’ll be at 6” of lift. The 2WD and 4WD RAM 1500s use a different suspension design and our kits are designed to fit the 4WD only. Hey Kyler, the 2013-2016 RAM 1500 trucks are offered with an optional airbag suspension from the factory that allows ride height to be adjusted between 2” lowered and 2” lifted standard ride height. We don’t manufacturer the airbags or conversion to airbags, but we offer a 4” lift that retains the capabilities of the factory system to be adjusted 2” lifted and 6” lifted. We offer IFS lift kits for other applications like the Chevy and Toyota as well, however those trucks aren’t offered with factory air ride. So I had the 4″ lift installed on my truck and now when I try to go either up or down I get the error “selected ride height not permitted due to payload” even though I’m not hauling/towing anything and the rest of the truck is still stock… Any ideas what could be causing that? Can you send me the contact info for a installer/dealer in the K.C. MO or KS either one works? Will 37s fit after the lift or is 35 the max? Thanks. Hey Rusty, you can find your local authorized BDS dealer/installer by heading to http://bds-suspension.com/distributor-lookup. On the 4″ air ride RAM 1500 we recommend a 35″ max tire size with stock fenders due to the ride height adjustability. 37s can clear when its aired up in the offroad modes (around 6″ of lift), but in the other modes where the ride height is lower (between 2-4″ of lift) you’ll have clearance issues. Could someone post a video or a truck with the lift on it and move I through all the lift heights on the air suspension? Would I be able to use the stock 20 inch rims with 35″ tires ? If I use wheel spacers ? What size ? We touch on that in kit note #4, the stock 20″ wheel can be reinstalled, but only with the stock size tires. Reason being the extra width of the 35×12.50 tires will rub against the new steering knuckles. We recommend 9″ wide, 4.5-5″ backspacing wheels. I believe the stock chrome 20″ wheels are 20×9 with 5.7″ backspacing so around a 1″ wheel spacer. Is there anyway to keep my 16 ram limited at top height in off-road 2 without it dropping to highway mode? Hey Tyler, unfortunately that is a safety feature written into the RAM’s air ride system. The air ride cannot be held in off road 2 mode, it will automatically lower the vehicle ride height above 25mph in 2WD, but should hold off ride height adjustment until 45mph in 4WD. Don’t think anyone will create a program for it? What about putting iy in off-road 2 an unplugging the module? What is the failure rate for an install with one of your authorized dealers? Although, granted you hear about problems more than success stories, it seems like the electronic/computer end of install is problematic and a big risk for a for a 50k truck. I would love to purchase this lift, just a little leary. Hi, i pit a 4inch kit on my ram 2016 ecodiesel air ride truck, i put 35in tire. So whats the alignment degree to use? Hey Brad, the recommended wheel/tire specs listed are based on what we have successfully tested. That said other sizes can be used but it may be necessary to trim the fenders. 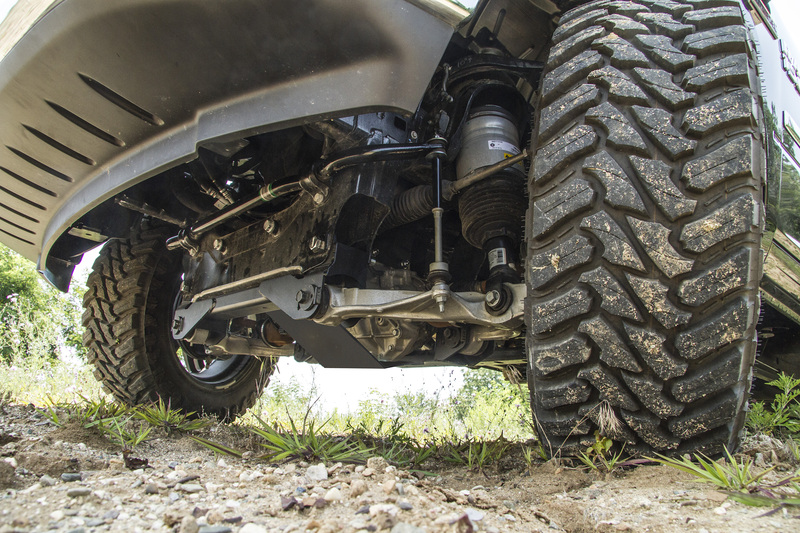 Your wheel/tires will fit, however may rub full turn in offroad situations. The 325/60r20 tire will measure out to roughly a 35.5″ x 13.00″ on 20×10 (4.75″ backspacing) wheels. Will this lift fit a a 2wd with air suspension? Thanks for your interest in BDS Suspension. Unfortunately the 2WD RAM 1500 uses a different suspension design than the 4WD RAM 1500. We’re only offer lift kits for the 4WD models. I had lift installed on 2016 limited 4×4. I am having an issue with the driver side cv axle making a high pitch noise around 2000 rpm. I took truck to dealership and they finally diagnosed the problem that the cv axle is angled slightly upward and the truck from factory has it slightly angled downward. Have you guys had this issue before and if so what is the remedy to have this fixed? 1) Will the 4″ lift impact the turning radius of the truck? I have seen some guys mention this in the online forums. 2) I want to use a 35″ or 34″ x 12.50″ tire. Most likely KO2’s. What backspacing and/or offset would I use if I want more of a ‘tucked under’ look vs a more aggressive stance? I don’t mind if they stick out…. just not 2 or 3 inches. 3) Will this lift level the truck or will it have the same rake as from the factory? Thanks for your interest in BDS Suspension and reaching out to us about your Air Ride RAM 1500. To answer your questions, the turning radius with the kit installed isn’t effected much. There is a slight increase due to the steering knuckle design to keep the truck FMVSS No.126 (ESC System) compliant, but it is very close to the original turning radius. The kit is designed to fit 35×12.50 tires on 18×9 or 20×9 wheels with 5″ backspacing. Wheels with larger backspacing (tucked under) will bring the tire close to rubbing the steering knuckle. This will give a moderate “stance” with the tires, see the black RAM 1500 photos in this release to see how 4″ lift/35×12.50 tire/20×9 5″ BS wheels will look installed. 17×9 wheels can be used with this kit as well, however due to the tie rod positioning you will need 4.5″ backspacing wheels for clearance. The air ride trucks uses ride height sensors at each corner. To allow the system to function properly the factory tail high rake is retained and the kit provides 4″ of lift all the way around. How does the Air Ride lift compare in terms of ride quality (primarily on the road) compared to a 4″ BDS coil spring lift in the same truck? I’m wondering if the coil spring setup with specifically tuned shocks front and rear for the much heavier 35 x 12.50 would ride better. I love the Air Ride, just making sure there is not a noticeable difference between air and coils. piggybacking off your other questions your Air Ride RAM 1500 will function like it does stock, just 4″ taller with room for 35″ tires. The kit corrects the suspension geometry and retains the air bags at each corner so ride quality will not be effected and we offer the rear FOX 2.0 shocks for improved on-road/off-road performance. That said the standard rear coils offers a great ride as well, however no ride height adjustability. BDS tech support can elaborate more, but I don’t believe you would be able to install just the front air ride and convert the rear to coils as the system is designed to control front and back. Likely it would need to be the full air-ride kit on there or remove the air ride system to install the standard strut/coil lift kit. Hello will you guys be offering an air ride delete kit? I have a 16 ram rebel but honestly hate the air ride I mean it rides great but off road there is no flex and if u r in off road mode the most u can do is 25 and if you are in mud and the sees that the tires spin faster it starts to lower itself. Can you guys help? At this moment i am living in Mexico and i like to order your BDS Lift Kit for my 2015 RAM. Is there any possibility to get this here o your offer shipping to Mexico? I recently was in an accident with my 2014 ram 1500 long horn 4 corner air suspension w/ 4″ BDS lift. Following the accident the repair shop was not able to get my trucks alignment within spec and the tech who tried to align mentioned that the front axles were spaced differently in relation to the front cross-member (this same tech had aligned my truck 4 months earlier and had it within spec and didnt mention anything about the spacing between the front axles and the front cross-member. Additionally I have been experiencing issues with the truck shifting into 4WD. The repair shop said they could not find any “apparent” damage to the differential mounting brackets and that there was no impact to the tires. They also said they thought it weird that one of the brackets attached to and engine mount allowing it to move with the engine…? 1. How fragile is the lift kit differential modification? What sort of force would be necessary to cause damage? thanks for your interest and for reaching out to us about kit options for your RAM 1500. 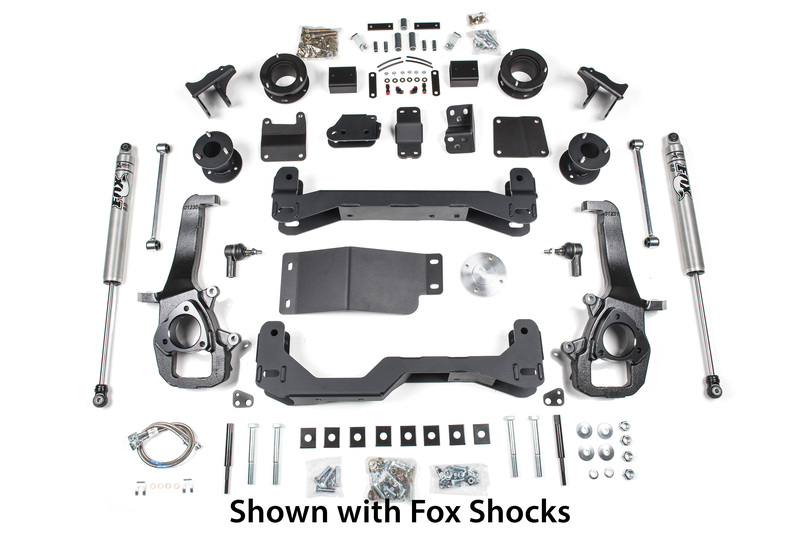 We offer 4″ and 6″ options for the RAM 1500 4WD trucks, at the 4″ lift height its a complete IFS lit kit with new crossmembers, steering knuckles, differential drop brackets, sway bar link extensions, driveshaft extension, top mounted strut spacer and new tie rod ends. In the rear we supply control arm drop brackets, shocks, and your choice of either a 2″ rear coil spacer or replacement 3″ coil springs. We recommend you take a measurement of the ride height stock to order the rear lift height for your desired stance. More info on the kit and available options can be found at http://bds-suspension.com/product?kid=664H. As for tire clearance the 4″ lift is designed to fit a 35×12.50 tire mounted on a 20×9 wheel with 5″ backspacing. Other wheel specs may work, however those are our recommendation to maximize clearance. we likely have both the NX2 and FOX 2.0 shocks that will work for your vehicle, however being that we don’t offer kits for the 2WD RAM 1500 you’ll need to contact our sales team so they can match up the shocks that will work best for your setup. Be sure to take a measurement of the shocks at ride height and note what type of bushings they use at top and bottom (stem, eyelet or bar pin). You can reach them at (517) 279-2135 or sales-bds@sporttruckusainc.com. We offer the 4″ lift system to fit the Air Ride equipped RAM 1500 4wd trucks. The kit retains full functionality of the factory air ride system, adjustable ride height modes, and OE ride quality. Our kit is designed to maintain the OE suspension/steering geometry, providing 4″ of additional lift at each of the ride height modes with clearance for 35″ tires. Hey have a 2016 rebel. Could someone email me more info about installing the kit on my rebel. Will leave email below. Is it possible to run a 20×12 wheel with a -45 offset .35×12.5r20 with this lift ? I have bushwaker extended flairs .i want an aggressive look . That tire/wheel will bolt the Air Ride equipped RAM with 4″ of lift, but may require some trimming for clearance in all driving conditions on road and off. While I really like the looks of the 4″ kit on the Rams, is there any plan to make maybe a 2″ kit, maybe with front and rear spacers, like on a leveling kit, used in conjunction with different length sensor links? Possibly to get it to ride at the “off road 2” height while on the normal setting. But maintaining stock ride quality. And have it under $500? No plans to offer a 2″ lift at this point. The air ride suspension has can adjust ride height by roughly 2″ up and 2″ down depending on the air ride mode. With a 2″ leveling kit that ride height adjustment would be between 0″ and 4″ of lift. 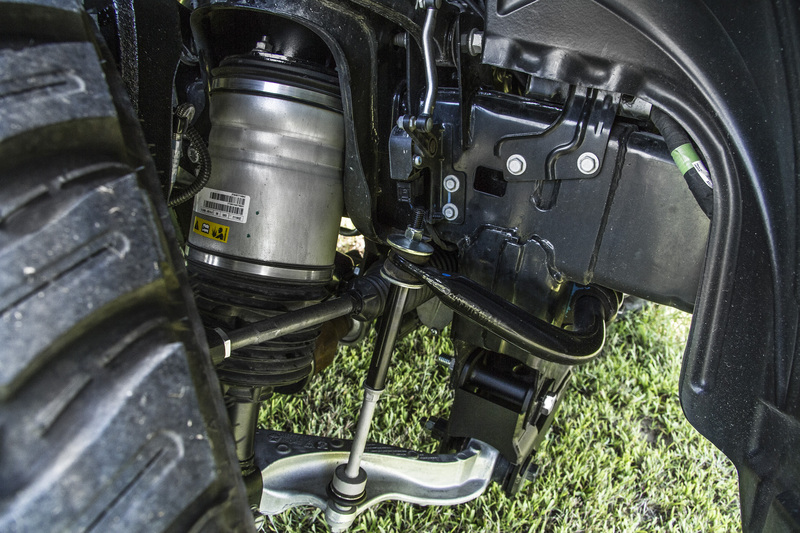 At the 4″ of lift the suspension/steering geometry is maxed out using the factory components. Among those components not addressed with a leveling kit are the differential-CV axle angles, UCA/LCA ball joints angles, steering tie rods, sway bar links, and brake lines. 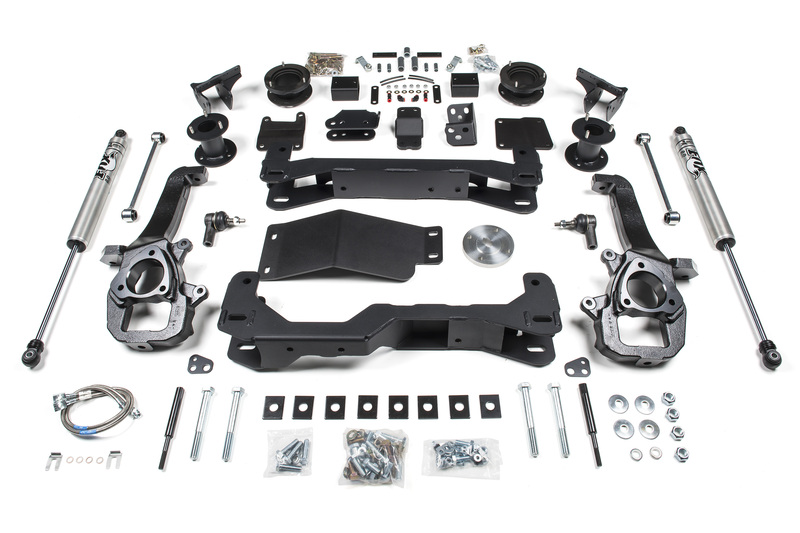 Our 4″ IFS kits are engineered to reposition everything to proper geometry at 4″ and allow full functionality of the air ride system between modes for 2″ to 6″ of lift without causing any suspension/drivetrain issues. For more on the topic feel free to contact our tech support team at (517) 279-2135. Hey Jeff, 22″ or larger wheels can be used with our kit, you’ll want to follow our recommendations based off the 20s… (22×9 w/ 5″ backspacing). Other width/backspacing can be used, but may require additional trimming/modification. Just bought a 2014 Ram 1500 Longhorn w/ ait suspension and i’m looking for a modest two inch lift. Anything available? Is there a downside with a body lift? I’m new to the late model truck world. It just looks week sitting so low. Hey David, while a small leveling kit is one option to get your AirRide RAM 1500 up a bit taller, its not something we offer. If you want to go the route of a small body lift check out Zone Offroad, they offer a 1.5″ body lift that will fit it, http://zoneoffroad.com/zone-offroad-products-1.5in-body-lift-dodge-ram-1500/D9150. As far as what we offer for the AirRide RAM 1500 trucks we have a 4″ suspension lift designed to retain full functionality of the air ride system in all driving modes while fitting 35″ tires. Hey Joe, at this point we don’t offer any lift/leveling options for the late model Grand Cherokees. Is this kit still compatible with the 2017 model 1500 Laramie Limited w/air? I have a 2014 dodge ram limited with factory air ride 2wd last time I checked your 4 inch lift only worked on 4wd is that still the case . Hey David, the 2WD and 4WD RAM 1500 trucks use a very different suspension design, we only offer kits for the 4WD RAM 1500 and RAM 1500 AirRide models and have no plans to develop kits for the 2WD models. I’m looking into a 2019 Ram Limited with air-ride. Any idea on when your 4″ lift will be available for the new Rams? Also, I can’t figure out how these lifts work with the factory air ride. I imagine “Normal Ride Height” is 4″ above factory, but what is the speed limit before it goes down into Aero mode? And is aero mode 0.5″ below the new lifted ride height or does it take it down to original factory ride height? Hey Anthony, we have kits in development for the new 2019 RAM 1500 and Rebel with the standard and air-ride suspension. That said I can’t get into details on our kits or expected release dates (company policy). As kits hit the shelves ready to ship we’ll be sending out announcements and begin promoting on our website and otehr media outlets. In reference to the how the air ride lift kits we offer for the 2013-2018 RAM 1500s, the kit is designed to retain full functionality of the air ride system and the adjustable ride height modes. Ride height is just 4″ taller than factory in each of those modes. Just bought 18rebel and they installed the 4” lift with factory air ride. Love the lift and rides great. My question, is there a way to level out the front more? I hear people talk about different links. Dont want to cancel warranty of lift. Do yall have any ideas how i can achieve this? Hey Jay, I reached out to our tech support team for their input on your question. The kit is designed to level the stance and should be within 1/2″ of front to back once installed (not all air ride trucks sit exactly the same). That said there is no way to make adjustments to the kit/ride height outside of the factory air ride system modes.